"Now, Piper's Terro-human Future History stories have been published in Federation and Empire, while the Paratime Police yarns can be found in Paratime! The Worlds of H. Beam Piper includes all the remaining stories that did not fit into either series or somehow slipped between the cracks." 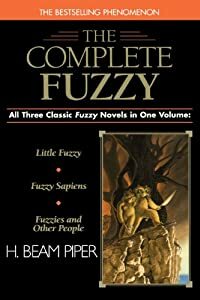 Beginning in 1976 with Little Fuzzy, Ace Books (now an imprint of Penguin Random House) reprinted most of H. Beam Piper's novels and short fiction, capping the effort with a third, previously-unpublished Fuzzy novel, 1984's Fuzzies and Other People. These reprints included all of Piper's Paratime yarns and all the novels and stories of his Terro-human Future History. For many Piper fans these Ace reprints—often with iconic cover illustrations by Michael Whelan—represented their first exposure to the wide range of Piper's work and they remain the most comprehensive published set of his novels and short fiction. Two of Piper's novels, Null-ABC, co-authored with John J. McGuire and originally serialized in Astounding Science Fiction, Vol. L, No. 6, February 1953 , and Vol. LI, No. 1, March 1953 (and reprinted by Ace in 1957 as Crisis in 2140 ), and Murder in the Gunroom , originally published by Knopf (1953), were not reprinted by Ace in this era. 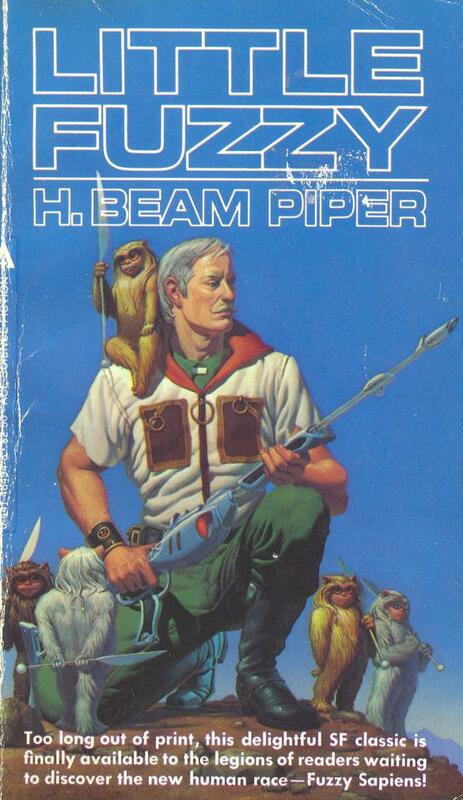 Little Fuzzy , H. Beam Piper, New York: Ace, 1976, with cover illustration by Michael Whelan. First printing, presumed (based upon ISBN and cover price; no printer's key number line), January 1976, presumed (based upon February 1976 review, others suggest 1975; "Copyright © 1962 by H. Beam Piper" on copyright page, presumably referring to original Avon "F-118" publication; "64A" in lower right corner of advertisement on page 175 and "45A" in lower right corner of advertisement on page 176), ISBN 0-441-48490-5, presumed ("48490" on cover, "441•48490•125" on spine), paperback, 174 pages, $1.25, stated. 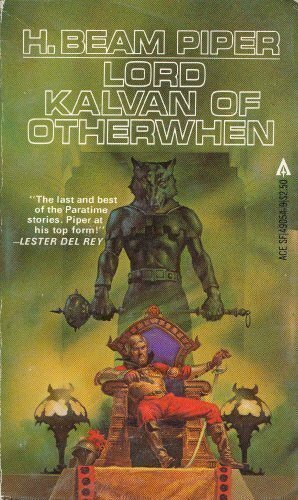 Note series title page lists "Other Ace books by H. Beam Piper," in the following order, as The Other Human Race (Fuzzy Sapiens)—presumably the 1964 Avon "G1220" edition, Space Viking—presumably the 1963 Ace "F-225" edition, Lord Kalvan of Otherwhen—presumably the 1965 Ace "F-342" edition, A Planet for Texans (by H. Beam Piper and J.J. McGuire)—presumably the 1958 Ace "D-299" edition, Crisis in 2140 (by H. Beam Piper and J.J. McGuire)—presumably the 1957 Ace "D-227" edition and The Cosmic Computer—presumably the 1964 Ace "F-274" edition (Zarthani.net hoard). Second printing, presumed (based upon ISBN and cover price; no printer's key number line), unknown date ("Copyright © 1962 by H. Beam Piper" on copyright page, presumably referring to original Avon "F-118" publication; "64B" in lower right corner of advertisement on page 175 and "45B" in lower right corner of advertisement on page 176), paperback, 174 pages, ISBN 0-441-48491-3, presumed ("48491" on cover, "441•48491•175" on spine), $1.75, stated. Note series title page lists "Other Ace books by H. Beam Piper," in the following order, as The Other Human Race (Fuzzy Sapiens)—presumably the 1964 Avon "G1220" edition, Space Viking—presumably the 1963 Ace "F-225" edition, Lord Kalvan of Otherwhen—presumably the 1965 Ace "F-342" edition, A Planet for Texans (by H. Beam Piper and J.J. McGuire)—presumably the 1958 Ace "D-299" edition, Crisis in 2140 (by H. Beam Piper and J.J. McGuire)—presumably the 1957 Ace "D-227" edition and The Cosmic Computer—presumably the 1964 Ace "F-274" edition (Zarthani.net hoard). Third printing, presumed (based upon ISBN and cover price; no printer's key number line), unknown date ("Copyright © 1962 by H. Beam Piper" on copyright page, presumably referring to original Avon "F-118" publication; no alphanumeric codes on advertisements on page 175 and page 176), paperback, 174 pages, ISBN 0-441-48492-1, presumed ("48492" on cover, "441•48492•195" on spine), $1.95, stated. Note series title page lists "Other Ace books by H. Beam Piper," in the following order, as The Other Human Race (Fuzzy Sapiens)—presumably the 1964 Avon "G1220" edition, Space Viking—presumably the 1963 Ace "F-225" edition, Lord Kalvan of Otherwhen—presumably the 1965 Ace "F-342" edition, A Planet for Texans (by H. Beam Piper and J.J. McGuire)—presumably the 1958 Ace "D-299" edition, Crisis in 2140 (by H. Beam Piper and J.J. McGuire)—presumably the 1957 Ace "D-227" edition and The Cosmic Computer—presumably the 1964 Ace "F-274" edition (Zarthani.net hoard). This edition was one of four books in an Ace Books boxed set (Ace 5-digit number 96456) with Fuzzy Sapiens, Space Viking and Lord Kalvan of Otherwhen (box in Zarthani.net hoard). Fourth printing, presumed (based upon ISBN and cover price; no printer's key number line), unknown date ("Copyright © 1962 by H. Beam Piper" on copyright page, presumably referring to original Avon "F-118" publication; "A-03" in lower right corner of advertisement on page 175 and "A-04" in lower right corner of advertisement on page 176), paperback, 174 pages, ISBN 0-441-48493-X, stated, $2.25, stated. Note series title page lists "Other Ace books by H. Beam Piper," in the following order, as The Other Human Race (Fuzzy Sapiens)—presumably the 1964 Avon "G1220" edition, Space Viking—presumably the 1963 Ace "F-225" edition, Lord Kalvan of Otherwhen—presumably the 1965 Ace "F-342" edition, A Planet for Texans (by H. Beam Piper and J.J. McGuire)—presumably the 1958 Ace "D-299" edition, Crisis in 2140 (by H. Beam Piper and J.J. McGuire)—presumably the 1957 Ace "D-227" edition and The Cosmic Computer—presumably the 1964 Ace "F-274" edition (Zarthani.net hoard). Fifth printing, presumed, unknown date, unknown ISBN (0-441-48495-6? ), unknown price. Sixth printing, presumed, unknown date, unknown ISBN (0-441-48495-6? ), unknown price. Seventh printing, June 1983, stated (printer's key number line? ), paperback, 174 pages, ISBN 0-441-48494-8, $2.50 (image courtesy Michael Smith's Ace Image Library). Eighth printing, September 1983, stated (no printer's key number line), paperback, 174 pages, ISBN 0-441-48496-4, stated, $2.75, stated (Zarthani.net hoard). Ninth printing, August 1984, stated (no printer's key number line), paperback, 174 pages, ISBN 0-441-48497-2, stated, $2.75, stated (Zarthani.net hoard). Tenth printing, September 1984, stated (no printer's key number line), paperback, 174 pages, ISBN 0-441-48497-2, stated (same as ninth printing), $2.75, stated (Zarthani.net hoard). Eleventh printing, stated, April 1985, presumed (printer's key number line? ), paperback, ISBN 0-441-48497-2 (same as ninth and tenth printings), $2.75. 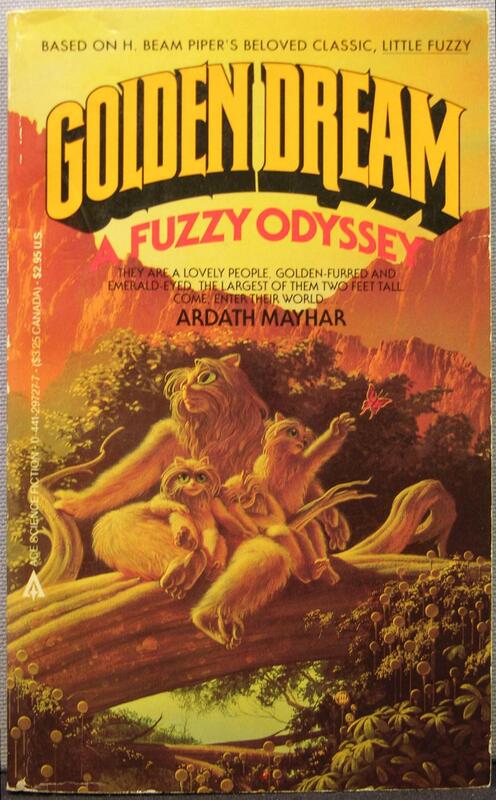 A Terro-human Future History yarn; the first Fuzzy novel. Originally published by Avon in 1962. Little Fuzzy, Ace 1976, cover illustration by Michael Whelan. 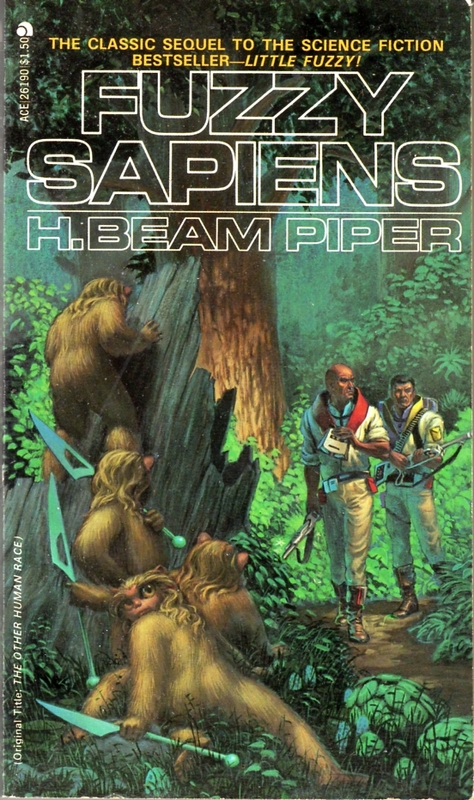 Fuzzy Sapiens , H. Beam Piper, New York: Ace, 1976, with cover illustration by Michael Whelan. First printing, June 1976, stated (no printer's key number line), paperback, 235 pages, ISBN 0-441-26190-6, presumed ("26190" on cover, "441 26190 150" on spine), $1.50, stated (Zarthani.net hoard). Second printing, presumed (based upon ISBN and cover price; no printer's key number line), August 1976, presumed, paperback, 235 pages, ISBN 0-441-26191-4, presumed ("26191" on cover, "441 26191 175" on spine), $1.75, stated (Zarthani.net hoard). Third printing, presumed (based upon ISBN and cover price; no printer's key number line), May 1978, presumed, paperback, 235 pages, ISBN 0-441-26192-2, presumed (0-441-26192-X, stated, but check digit indicates invalid ISBN; this ISBN immediately precedes in sequence that for the first printing of The Fuzzy Papers below), $1.95, stated, (Zarthani.net hoard). This edition was one of four books in an Ace Books boxed set (Ace 5-digit number 96456) with Little Fuzzy, Space Viking and Lord Kalvan of Otherwhen) (box in Zarthani.net hoard). Fourth printing, presumed (based upon ISBN and cover price; printer's key number line? ), unknown date, paperback, 235 pages, ISBN 0-441-26189-2, stated, $2.25, stated (see image). Fifth printing, June 1983, stated (no printer's key number line), paperback, 235 pages, ISBN 0-441-26188-4, stated, $2.50, stated (Zarthani.net hoard). Sixth printing, September 1983, stated (no printer's key number line), paperback, 235 pages, ISBN 0-441-26187-6, stated, $2.75, stated (Zarthani.net hoard). Seventh printing, presumed, unkown date, unknown ISBN (0-441-26186-8? ), unknown price. Eighth printing, August 1984, stated (no printer's key number line), paperback, 235 pages, ISBN 0-441-26195-7, sated (this ISBN immediately follows in sequence that for the second printing of The Fuzzy Papers below), $2.75, stated (Zarthani.net hoard). Ninth printing, September 1984, stated (printer's key number line? ), paperback, 235 pages, ISBN 0-441-26195-7, stated (same as eighth printing), $2.75, stated. Tenth printing, August 1985, stated (no printer's key number line), paperback, 235 pages, ISBN 0-441-26196-5, stated, $2.95, stated (Zarthani.net hoard). A Terro-human Future History novel. Sequel to Little Fuzzy. Originally published as The Other Human Race by Avon in 1964. Fuzzy Sapiens, Ace 1976, cover illustration by Michael Whelan. Second printing, presumed (based upon ISBN and cover price; no printer's key number line), January 1977, presumed ("Copyright © 1963 by Ace Books" on copyright page, presumably referring to original "F-225" publication; "6H" in lower right corner of advertisement on page 245, "7I" in lower right corner of advertisement on page 246, "33I" in lower right corner of advertisement on page 247, "34C" in lower right corner of advertisement on page 248 and "35K" in lower right corner of advertisement on page 249), paperback, 243 pages, ISBN 0-441-77780-5, presumed ("77780" on cover, "441 77780 150" on spine), $1.50, stated (Zarthani.net hoard). Third printing, presumed (based upon ISBN and cover price; no printer's key number line), unknown date (presumed 1977; "Copyright © 1963 by Ace Books" on copyright page, presumably referring to original "F-225" publication; "6H" in lower right corner of advertisement on page 245, "7I" in lower right corner of advertisement on page 246, "33I" in lower right corner of advertisement on page 247, "34C" in lower right corner of advertisement on page 248 and "35K" in lower right corner of advertisement on page 249), paperback, 243 pages, ISBN 0-441-77781-3, stated (the ISBN which immediately follows this ISBN in sequence is for a non-Piper Ace book), $1.95, stated (Zarthani.net hoard). This edition was one of four books in an Ace Books boxed set (Ace 5-digit number 96456) with Little Fuzzy, Fuzzy Sapiens and Lord Kalvan of Otherwhen (box in Zarthani.net hoard). Fourth printing, stated (according to printer's key number line), December 1980, stated, paperback, 243 pages, ISBN 0-441-77779-1, stated, $2.25, stated (Zarthani.net hoard). Fifth printing, presumed (based upon ISBN and cover price; no printer's key number line), September 1983, stated, paperback, 243 pages, ISBN 0-441-77784-8, stated (the ISBN which immediately precedes this ISBN in sequence is for a non-Piper Ace book), $2.75 (Zarthani.net hoard). A Terro-human Future History novel. Originally serialized in Analog Science Fact — Science Fiction, Vol. LXX, No. 3, November 1962 , Vol. LXX, No. 4, December 1962 , Vol. LXX, No. 5, January 1963 , and Vol. LXX, No. 6, February 1963 . 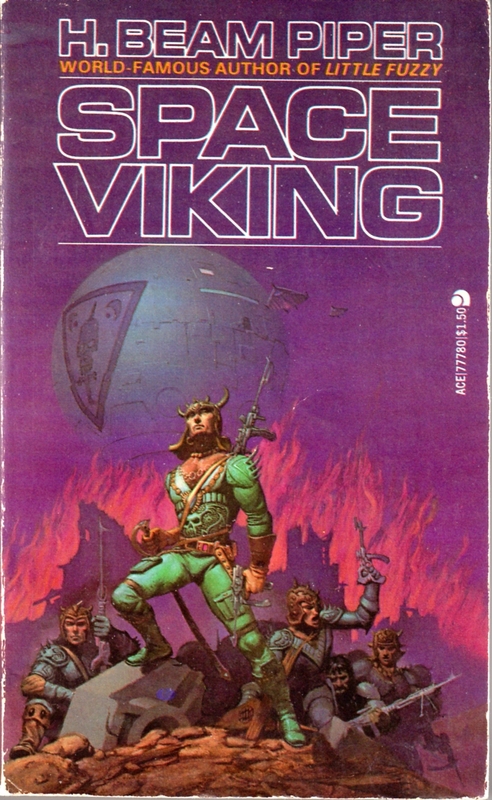 Space Viking, Ace 1977, cover illustration by Michael Whelan. Second printing, presumed (based upon ISBN and cover price; no printer's key number line), May 1977, presumed, paperback, 249 pages, ISBN 0-441-49051-4, stated, $1.50, stated (Zarthani.net hoard). Third printing, presumed (based upon ISBN and cover price; no printer's key number line), unknown date, paperback, 249 pages, ISBN 0-441-49052-2, $1.95, stated (Zarthani.net hoard). This edition was one of four books in an Ace Books boxed set (Ace 5-digit number 96456) with Little Fuzzy, Fuzzy Sapiens and Space Viking (box in Zarthani.net hoard). Fourth printing, presumed (based upon ISBN and cover price; no printer's key number line), June 1981, stated, paperback, 249 pages, ISBN 0-441-49053-0, stated, $2.25, stated (Zarthani.net hoard). Fifth printing, presumed (based upon ISBN and cover price; printers's key number line? ), July 1982, presumed, paperback, 249 pages, ISBN 0-441-49054-9, stated, $2.50, stated. Sixth printing, presumed (based upon ISBN and cover price; no printer's key number line), January 1984, stated, paperback, 249 pages, ISBN 0-441-49055-7, stated, $2.75, stated (Zarthani.net hoard). A Paratime novel. Original paperback edition published by Ace in 1965. Combined and expanded version of the novellas "Gunpowder God," originally published in Analog Science Fiction — Science Fact, Vol. LXXIV, No. 3, November 1964 , and "Down Styphon!," originally published in Analog Science Fiction — Science Fact, Vol. LXXVI, No. 3, November 1965 . 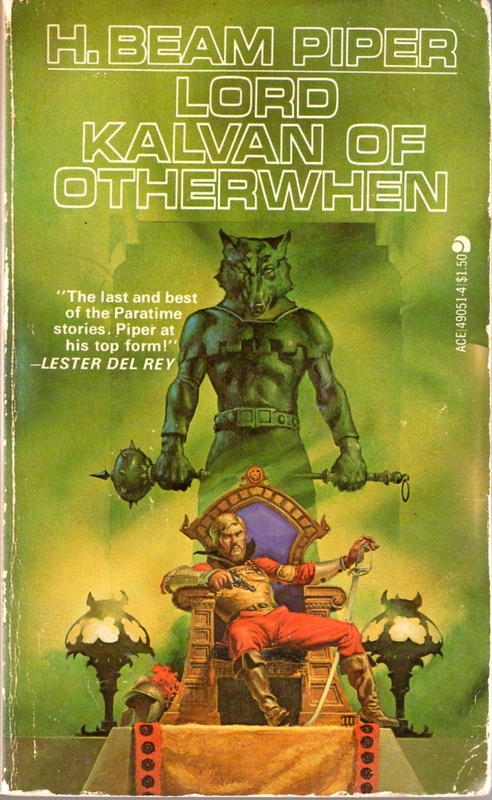 Lord Kalvan of Otherwhen, Ace 1977, cover illustration by Michael Whelan. First printing, presumed (based upon ISBN and cover price; no printer's key number line), unknown date (OCLC suggests 1977; "Copyright © 1963 by H. Beam Piper" on copyright page, presumably referring to Ace "F-274" publication; "6H" in lower right corner of advertisement on page 250 and "7I" in lower right corner of advertisement on page 251), paperback, 249 pages, ISBN 0-441-11756-2, stated, $1.50, stated (Zarthani.net hoard). Second printing, presumed (based upon ISBN and cover price; no printer's key number line), unknown date ("Copyright © 1963 by H. Beam Piper" on copyright page, presumably referring to Ace "F-274" publication), paperback, ISBN 0-441-11757-0, presumed (0-441-11757-6, stated, but check digit indicates invalid ISBN; the ISBN which immediately follows this ISBN in sequence may not have been used), $1.95, stated (Zarthani.net hoard). Third printing, November 1983, stated (no printer's key number line), paperback, 249 pages, ISBN 0-441-11759-7, stated (the ISBN which immediately precedes this ISBN in sequence may not have been used), $2.75, stated (Zarthani.net hoard). A Terro-human Future History novel. Originally published as Junkyard Planet by Putnam in 1963. Original paperback edition reissued by Ace in 1964 (different paperback edition). Expanded version of the novelette "Graveyard of Dreams" originally published in Galaxy Science Fiction, Vol. 15, No. 4, February 1958 . 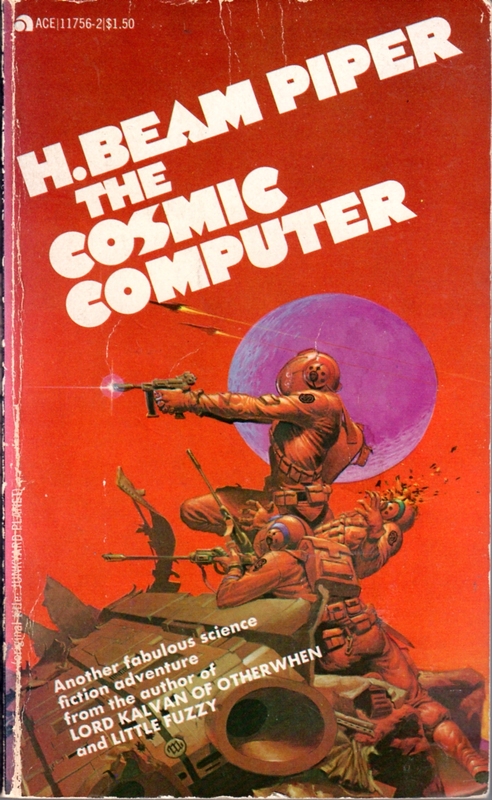 The Cosmic Computer, Ace 1978, cover illustration by Michael Whelan. 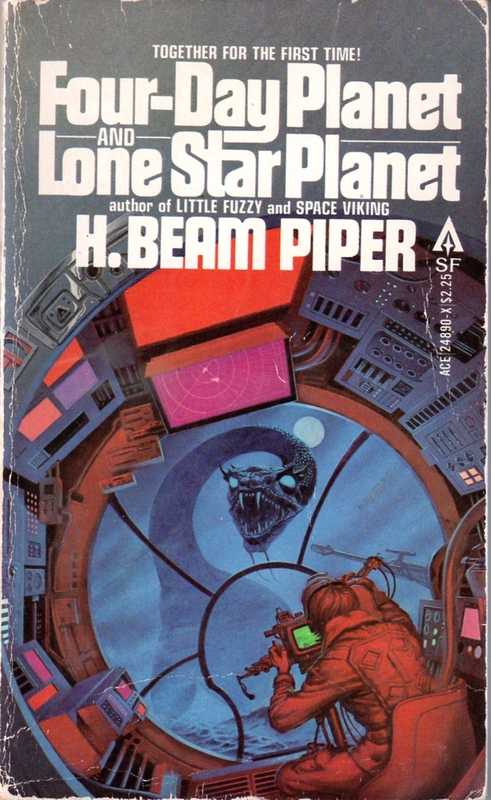 Four-Day Planet , H. Beam Piper, and Lone Star Planet , H. Beam Piper and John J. McGuire, New York: Ace, 1979, with cover illustration (from Four-Day Planet) by Michael Whelan. Omnibus edition of the Terro-human Future History novel Four-Day Planet, originally published by Putnam in 1961, and the stand-alone novella Lone Star Planet, co-authored with John J. McGuire, originally published in Fantastic Universe Science Fiction, Vol. 7, No. 3, March 1957 , and reissued by Ace in 1958 as A Planet for Texans . Four-Day Planet and Lone Star Planet, Ace 1979, cover illustration by Michael Whelan. The Fuzzy Papers , H. Beam Piper, New York: Ace, 1980, with cover illustration (detail from Fuzzy Sapiens) by Michael Whelan and interior illustrations by Victoria Poyser. First printing, stated (and according to printer's key number line), September 1980, stated, paperback, 406 pages, ISBN 0-441-26193-0, stated (this ISBN immediately follows in sequence that for the third printing of Fuzzy Sapiens above), $2.75, stated (Zarthani.net hoard). Second printing, presumed (based upon ISBN and cover price; no printer's key number line), August 1982, stated, paperback, 406 pages, ISBN 0-441-26194-9, stated (this ISBN immediately precedes in sequence that for the eighth printing of Fuzzy Sapiens above), $2.95, stated (Zarthani.net hoard). Fuzzy Papers, Ace 1980, cover illustration by Michael Whelan. 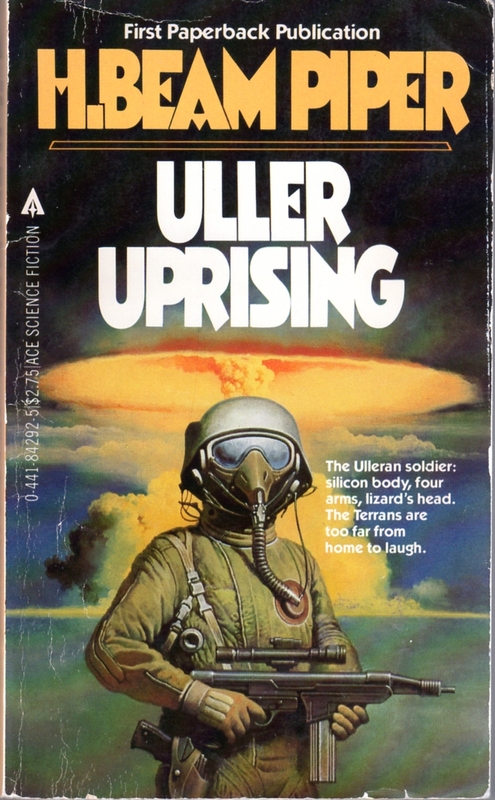 Uller Uprising , H. Beam Piper, New York: Ace, 1983, with cover illustration by Gino D'Achille, and including introductory essays by John D. Clark (from 1952 Twayne edition of The Petrified Planet ). A Terro-human Future History novel. Originally anthologized in The Petrified Planet , New York: Twayne, 1952. Uller Uprising, Ace 1983, cover illustration by Gino D'Achille. 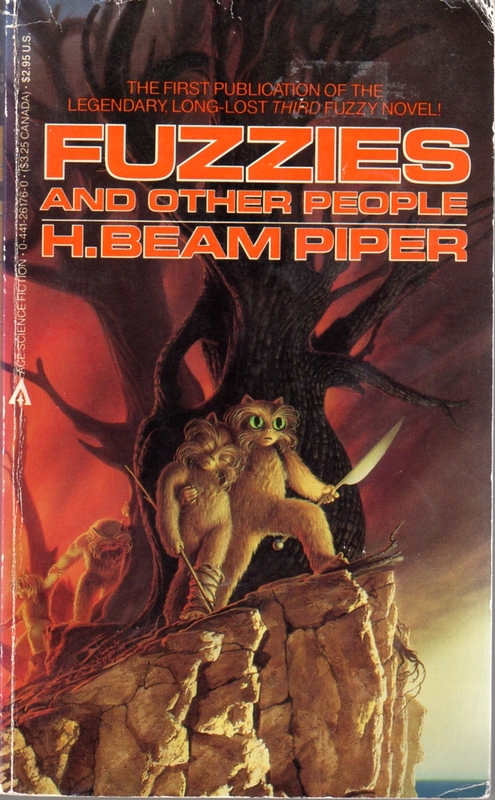 Fuzzies and Other People , H. Beam Piper, New York: Ace, 1984, with cover illustration by Michael Whelan. First printing, August 1984, stated (no printer's key number line), paperback, 216 pages, ISBN 0-441-26176-0, stated, $2.95, stated (Zarthani.net hoard). Third printing, June 1985, presumed (apparently acknowledges November 1984 Book Club Edition; printer's key number line? ), paperback, 216 pages, ISBN 0-441-26176-0, stated (same as first printing), $2.95, stated. Fourth printing, November 1986, presumed (printer's key number line? ), paperback, 216 pages, ISBN 0-441-26177-9, stated, $2.95, stated. Not a reprint, but a posthumously-published original sequel to Fuzzy Sapiens. Reissued in November 1984 as Book Club Edition . Fuzzies and Other People, Ace 1984, cover illustration by Michael Whelan. More than a decade after reprinting most of his work, Ace issued two omnibus editions of Piper's work. 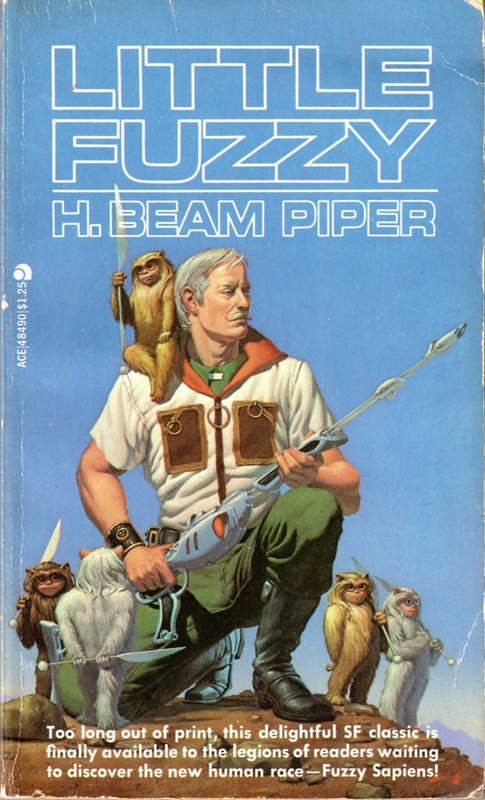 The Complete Fuzzy , H. Beam Piper, New York: Ace, 1998, with cover illustration (detail from Fuzzies and Other People) by Michael Whelan. First printing, December 1998, stated (and according to printer's key number line), trade paperback, 454 pages, ISBN 0-441-00581-0, stated, $15.00, stated (Zarthani.net hoard). The "Fuzzy Trilogy" omnibus of Little Fuzzy, Fuzzy Sapiens, and Fuzzies and Other People. The Complete Fuzzy, Ace 1998, cover illustration by Michael Whelan. The Complete Paratime , H. Beam Piper (John F. Carr, ed., uncredited), New York: Ace, 2001, with cover illustration by Dave Dorman. First printing, March 2001, stated (and according to printer's key number line), trade paperback, 424 pages, ISBN 0-441-00801-1, stated, $15.00, stated (Zarthani.net hoard). An omnibus of the Piper stories collected by Carr in Paratime! and Piper's novel Lord Kalvan of Otherwhen . Reissued in June 2001 as Science Fiction Book Club hardcover (Zarthani.net hoard). The Complete Paratime, Ace 2001, cover illustration by Dave Dorman. Besides reprinting most of Piper's work, in this same period Ace published three, original, authorized sequels to Piper works by other authors. 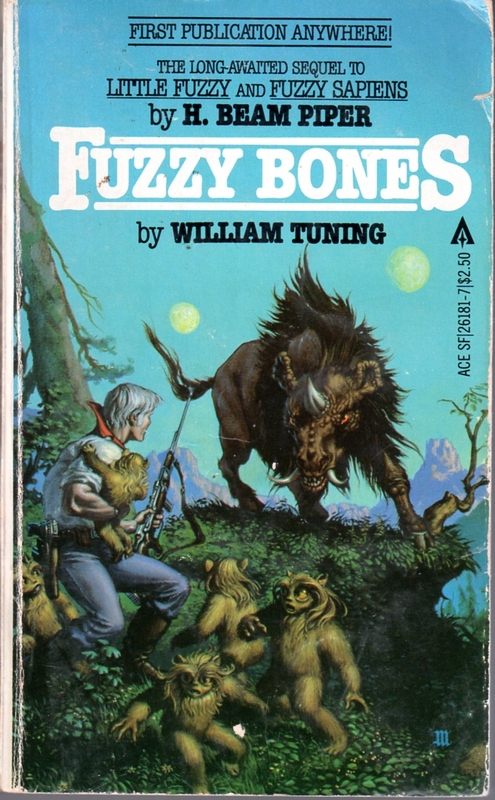 Fuzzy Bones , William Tuning, New York: Ace, 1981, with cover illustration by Michael Whelan. First printing, December 1981, stated (and according to printer's key number line), paperback, 375 pages, ISBN 0-441-26181-7, stated, $2.50, stated (Zarthani.net hoard). Second printing, presumed (according to printer's key number line; first stated), unknown date, paperback, 375 pages, ISBN 0-441-26181-7, stated (same as first printing), $2.50, stated (Zarthani.net hoard). Third printing, January 1983, stated (no printer's key number line), paperback, 375 pages, ISBN 0-441-26182-5, stated, $2.95, stated (Zarthani.net hoard). A sequel to Piper's novels Little Fuzzy and Fuzzy Sapiens , issued prior to the discovery of Piper's own sequel, Fuzzies and Other People . Fuzzy Bones by William Tuning, Ace 1981, cover illustration by Michael Whelan. 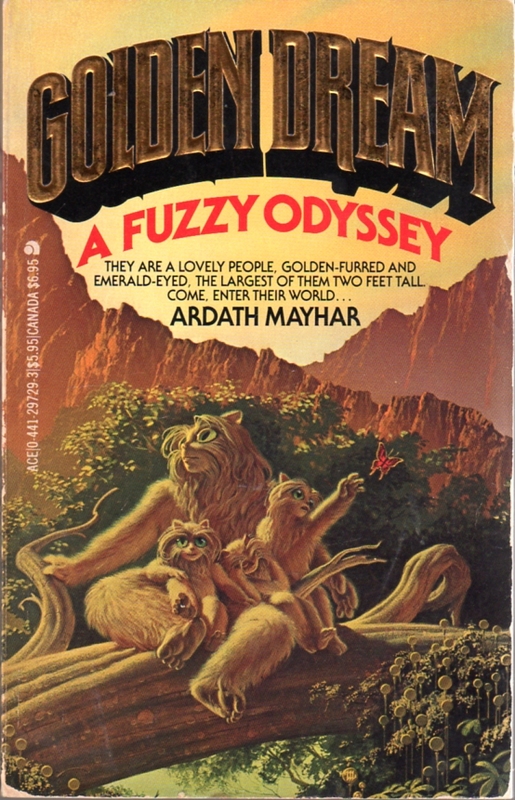 Golden Dream: A Fuzzy Odyssey , Ardath Mayhar, New York: Ace, 1982, with cover illustration by Michael Whelan. First printing, October 1982, stated (no printer's key number line), trade paperback, 303 pages, ISBN 0-441-29729-3, stated (the ISBN which immediately precedes this ISBN in sequence is for a non-Piper Ace book), $6.95, stated (Zarthani.net hoard). Second printing, presumed (based upon ISBN and cover price; no printer's key number line), September 1983, stated, paperback, 269 pages, ISBN 0-441-29726-9, stated, $2.95, stated (Zarthani.net hoard). Third printing, presumed (based upon ISBN and cover price; printer's key number line? ), August 1984, presumed, paperback, 269 pages, ISBN 0-441-29727-7, presumed (the ISBN which immediately follows this ISBN in sequence is for a non-Piper Ace book), $2.95, presumed. 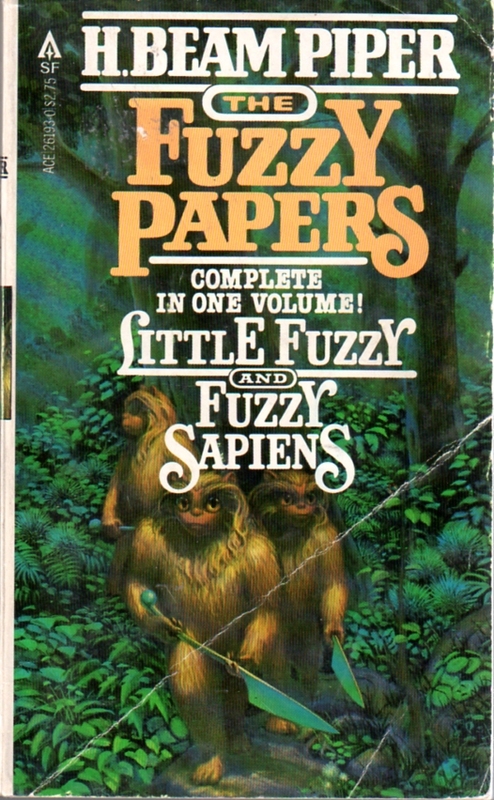 Another sequel to Piper's novels Little Fuzzy and Fuzzy Sapiens , written from the perspective of the Fuzzies, also issued prior to the discovery of Piper's own sequel, Fuzzies and Other People . Golden Dream by Ardath Mayhar, Ace 1982, cover illustration by Michael Whelan. 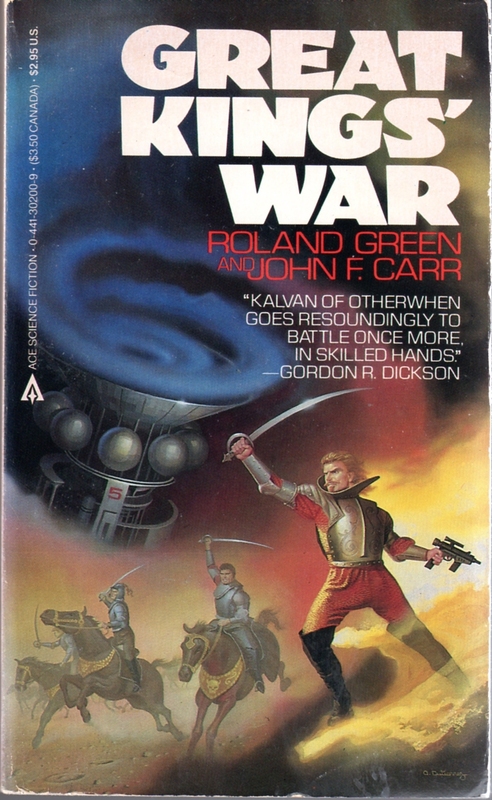 Great Kings' War , Roland Green and John F. Carr, New York: Ace, 1985, with cover illustration by Alex Gutierrez. First printing, March 1985, stated (no printer's key number line), paperback, 357 pages, ISBN 0-441-30200-9, stated, $2.95, stated (Zarthani.net hoard). 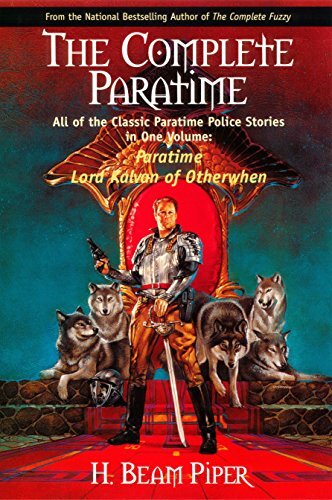 A sequel to Piper's novel Lord Kalvan of Otherwhen . Expanded and reissued in 2006 by Carr's Pequod Press (Zarthani.net hoard). Great Kings' War, by Roland Green and John. F. Carr, Ace 1985, cover illustration by Alan Gutierrez. Michael Sauers' guide "Editions and Printings, How to Tell the Difference" has been very helpful in compiling this information on the Ace Books Piper reprints.